According to a story, a giant crocodile was shot was near Normanton, Queensland, Australia. In the Norman river It was shot in July 1958, and nicknamed Krys after the person who shot it. 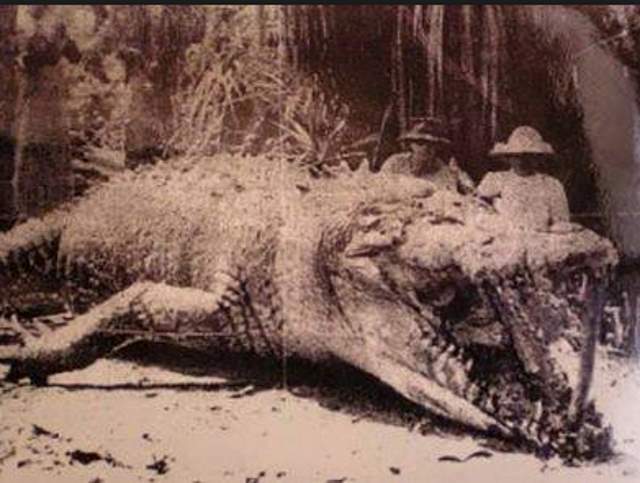 It was claimed at 28 foot 4 inches (8.64 meters) there is a life size replica of it at Normanton, Queensland, Australia. Zoologist Adam Britton says: “I’ve never counted “Krys” because it’s just a story – there’s no evidence at all to back it up, and it just seems so far outside the maximum possible range for this species that I’d need some pretty solid evidence to believe it. That’s why it never appears in any official statistics. The only known photo of the Krys Crocodile. Note that the forced perpective was used in the photo, a technique that employs optical illusion to make an object appear larger than it actually is.